Here at Squeeky Kleen we use 'The Reach and Wash systems' to clean both windows and solar panels. Looking after your solar panel should be a priority and without the proper equipment, accessing roof-mounted panels can be dangerous. We carry out all aspects of solar panel cleaning utilising our advanced Reach and Wash® System, which is also Eco-friendly and can safely clean, roof-mounted solar panels from the ground. The efficiency of your solar panels can decrease with dirt build up, together with, bird droppings, leaves and other debris they all contribute to lowering efficiency, contradicting your efforts in saving energy. 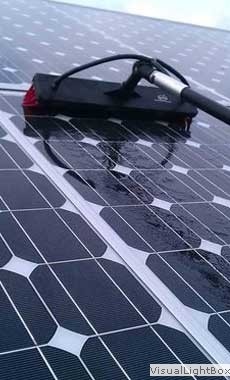 Only appropriate regular cleaning will keep your solar panels producing energy at their rated capacity. We aim to offer all our customers with an unrivalled service at competitive prices. Tap or mains water whether hard or not can damage your solar panels. Unfiltered mains water can leave water spots due to naturally occurring heavy minerals present in the water and varying pH levels, detergents and other cleaning chemicals can also cause corrosion to the aluminium frames of solar panels. If you would like more information on the services we offer or would like to request a free quotation, please feel free to get in touch. We will happily provide you with all the time and advice you need.